I’m doing something a little different today. Instead of reviewing a single book, I’m going to highlight an entire series. This is because I started the series well before I started my blog and I just read book six. Since I never reviewed one through five, and I have no intention of rereading them right now, I’ll simply share a series overview with you. Mary Faber is a young orphan girl (twelve, I think, in book one) in London’s Cheapside district. She joins a gang that soon becomes her family. She and some of her fellow waifs sign on as ships boys. She is in disguise, of course, as the young boy Jacky Faber. Brash and fearless, Jacky manages to get into more scrapes than you can imagine. This whole series is one exciting adventure after another. Seriously, you can hardly draw breath between them. But everywhere she goes, Jacky comes out on top. Having gained the name “Bloody Jack” through innocent circumstance, she becomes something of a legend in the Royal Navy and on the high seas. It’s unrealistic, really, the way this young teen girl comes to command pirate ships and warships and such, but she’s extremely lovable. And her adventures are very fun to read! I do have to give a few words of caution. These books contain mild profanities (quite liberally at times) as well as some OMGs. And Jacky, as she ages, comes into more and more (several per book) sexually charged situations where her “maidenhood” is threatened, questioned, joked about, etc., and her maturing body is often referred to, described, and scantily clad. Furthermore, though she is affianced to Jaimy, she does a lot of kissing on other fellows and even curls up next to many of them, as sleeping alone gives her nightmares. She’s basically a good girl; however, an older audience would be recommended. I’d say 14+. Bloody Jack: Being an Account of the Curious Adventures of Mary “Jacky” Faber, Ship’s Boy (book one): Life as a ship’s boy aboard HMS Dolphin is a dream come true for Jacky Faber. Gone are the days of scavenging for food and fighting for survival on the streets of eighteenth-century London. Instead, Jacky is becoming a skilled and respected sailor as the crew pursues pirates on the high seas. There’s only one problem: Jacky is a girl. And she will have to use every bit of her spirit, wit, and courage to keep the crew from discovering her secret. 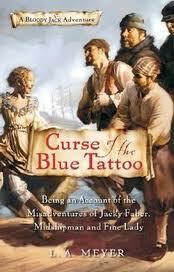 This could be the adventure of her life–if only she doesn’t get caught. . . .
Curse of the Blue Tattoo: Being an Account of the Misadventures of Jacky Faber, Midshipman and Fine Lady (book two): After being forced to leave HMS Dolphin and Jaimy, her true love, Jacky Faber is making a new start at the elite Lawson Peabody School for Young Girls in Boston. But growing up on the streets of London and fighting pirates never prepared Jacky for her toughest battle yet: learning how to be a fine lady. Everything she does is wrong. Her embroidery is deplorable, her French is atrocious, and her table manners–disgusting! Then there’s the small matter of her blue anchor tattoo. . . .Despite her best efforts, Jacky can’t seem to stay out of trouble long enough to dedicate herself to being ladylike. But what fun would that be, anyway? 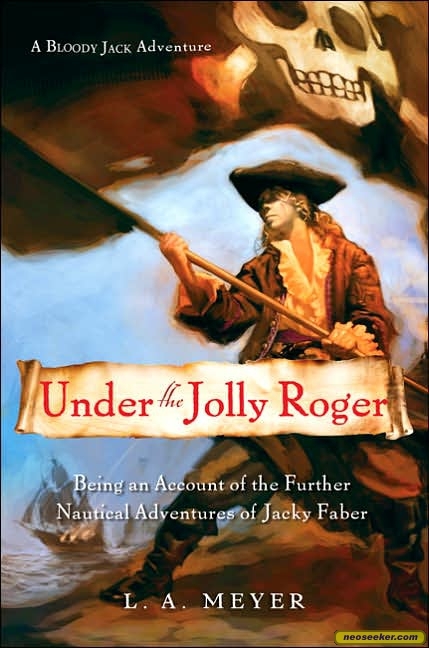 Under the Jolly Roger: Being an Account of the Further Nautical Adventures of Jacky Faber (book three): A Pirate at heart, unlikely heroine Jacky Faber returns to sea in a truly swashbuckling tale filled with good humor, wit, and courage. After Leaving the Lawson Peabody School for Young Girls in Boston–under dire circumstances, of course–Jacky boards a whaling ship bound for London, where she hopes to find her beloved Jaimy. But things don’t go as planned, soon she is off on a wild misadventure at sea. She thwarts the lecherous advances of a crazy captain, rallies the sailors to her side, and ultimately gains command of a ship in His Majesty’s Royal Navy. But Jacky’s adventures don’t end there…soon she is being called a pirate, and there’s s price on her head! 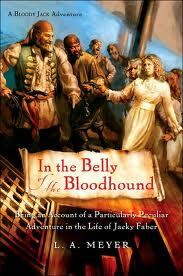 In the Belly of the Bloodhound: Being an Account of a Particularly Peculiar Adventure in the Life of Jacky Faber (book four): The British crown has placed a price on Jacky’s head, so she returns to the Lawson Peabody School for Young Girls in Boston to lay low. But the safe haven doesn’t last–a school outing goes awry as Jacky and her classmates are abducted and forced into the hold of the Bloodhound, a ship bound for the slave markets on the Barbary Coast. All of Jacky’s ingenuity, determination, and plain old good luck will be put to the test as she rallies her delicate classmates to fight together and become their own rescuers. 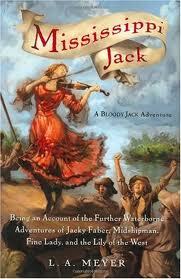 Mississippi Jack: Being an Account of the Further Waterborne Adventures of Jacky Faber, Midshipman, Fine Lady, and Lily of the West (book five): The intrepid Jacky Faber, having once again eluded British authorities, heads west, hoping that no one will recognize her in the wilds of America. There she tricks the tall-tale hero Mike Fink out of his flatboat, equips it as a floating casino-showboat, and heads south to New Orleans, battling murderous bandits, British soldiers, and other scoundrels along the way. Will Jacky’s carelessness and impulsive actions ultimately cause her beloved Jaimy to be left in her wake? Bold, daring, and downright fun, Jacky Faber proves once again that with resilience and can-do spirit, she can wiggle out of any scrape . . . well, almost. 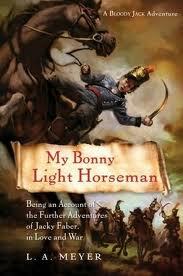 My Bonny Light Horseman: Being an Account of the Further Adventures of Jacky Faber, in Love and War (book six): The infamous pirate, riverboat seductress, master of disguise, and street-urchin-turned-sailor Jacky Faber has been captured by the French and beheaded in full view of her friends and crew. Inconceivable? Yes! The truth is she’s secretly forced to pose as an American dancer behind enemy lines in Paris, where she entices a French general into revealing military secrets—all to save her dear friends. Then, in intrepid Jacky Faber style, she dons male clothing and worms her way into a post as galloper with the French army, ultimately leading a team of men to fight alongside the great Napoleon. In this sixth installment of the Bloody Jack Adventures series, love and war collide as the irrepressible Jacky Faber sets off on a daring adventure she vowed she’d never take. There are several more in the series, but this is as far as I’ve read. As an adult, I enjoyed these immensely. But let me again emphasize a 14+ age ranking due to a good deal of sexual suggestion, though Jacky’s behavior remains above board. What a series. Sounds like a good read for young people. Lots of actions. Like how you handled the other books — no way could I remember the details of past stories to review six books. Glad you shared the entire series to date. These are fun, light reads. I like to grab one if I go away on a trip. I haven’t introduced Jacky to my kids, however.